Tech Talk: It’s a Mystery! You don’t often see osprey and transit mentioned together, but that was the case this week when Sound Transit and Seattle City Light teamed up to install an osprey pole adjacent to our Link Operations and Maintenance Facility in the SODO area of Seattle. It’s an interesting story that goes back a few years. A pair of osprey have been nesting on a cell phone tower located on the Operations and Maintenance property for at least nine seasons, hatching chicks each year. Then last fall, T-Mobile removed the nest from the cell tower and installed a device to prevent the birds from returning. Bird nests can interfere with cell tower and power pole operations, sometimes even causing fires on the poles. Meanwhile, dedicated O&M staff had been following the osprey for years and experts knew the birds would likely return looking to nest on another pole in the area. 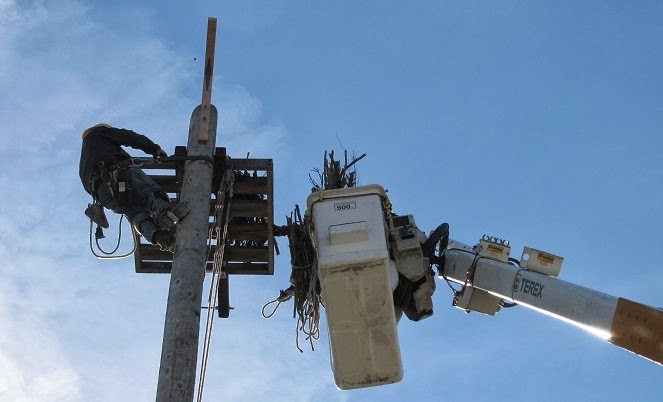 To avoid future problems, we worked with Seattle City Light this week to install a 60-foot tall telephone pole with an osprey platform on top in the corner of our O&M Facility. The pole was successfully installed and will be a safe, long-term place for the birds to nest.